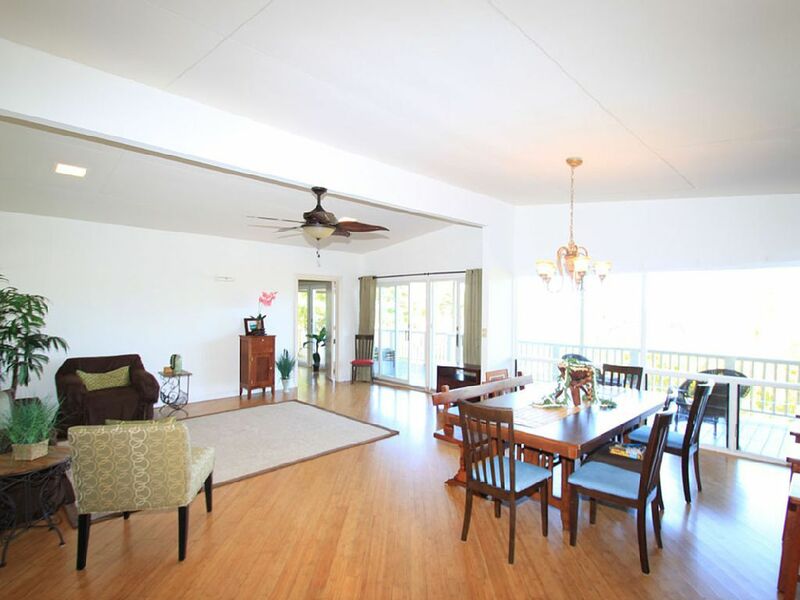 This amazing home is located just a short walk from beautiful Lanikai Beach. The property captures the true feeling of a tropical paradise lifestyle. This charming executive three bedroom home boasts 2600 square feet of island living. This Executive Vacation Rental is pleasantly spacious....with plenty of room to gather and play cards, have great conversation with all the family or simply enjoy. This furnished home has one large master suites, two additional bedrooms (all bedrooms with air conditioning), gourmet kitchen equipped with Viking appliances, bamboo flooring, and wrap around view lanai. Enjoy sensational panoramic views of the Mokolua Islands from the main floor location and master bedroom. The Living Room opens to a large lanai great for entertaining and watching breathe taking sunrises. The house is just a quick walk to the beautiful white sands of Lanikai beach. Voted ten most beautiful beaches in the world. This three bedroom home is perfect for family vacations, reunions, or couples traveling together. Create your vacation memories here in this three bedroom Tropical Charmer! Onsite manager available for any issues or requests. LONG TERM RENTAL ALSO AVAILABLE!!!! AMAZING RATES!! Check out the Mokolua Islands from your wrap around Lanai. Relax and enjoy a beverage of your choice on the lanai while watching paddlers and wind surfers. This view takes you away and makes you glad you have choosen Lanikai as your vacation destination. Just bring your bathsuit....as everything else you need is already supplied for you. All Viking Appliances for those who want to cook as their form of entertainment. If you'd rather just BBQ and enjoy the view that's good too. Enjoy the amenities of a home and cook or go out..enjoy! Beautiful views of the Mokolua Islands. Bamboo floors and amazing Viking Kitchen appliances, private on property parking, ample space for one large family or multiple families. Thanks for a wonderful stay. This property had panoramic views of the Mokes and was a convenient 5-10 min walk to the beach. Some of the furniture and appliances were a bit dated, but in general the place had everything we needed. We had a minor insect problem the first night (a typical problem in this tropical weather), but Patrick, the manager was extremely responsive when we told him about it, and had the house sprayed with an eco/green pest spray within hours. Our group enjoyed our stay at the property although things could have been better. The place was clean and had plenty of space as advertised. The bedrooms do have A/C units which keep them cool but the other rooms do not and without trade winds, the rooms were very hot during our stay, especially one of the bathrooms by the two bedrooms. That room needed an exhaust fan. The deck was the best place to relax when the trade winds returned. We met Patrick, the property manager, and he was pleasant and informative but then left us for a short trip. That was OK, except that we had a difficult time with the TV while trying to watch some of the World Cup action. We did text him several times and he did respond but his instructions proved fruitless until we did resolve the issue on our own. We finally got the correct sequence of pushing buttons on the two remotes to see some games. A detailed set of directions would be helpful. The kitchen was great although we were surprised to find a Viking fridge with no ice maker. While Patrick was gone, we were stunned to see another car parked in the driveway once and awhile. Never did see the owner of the car. The walk to the beautiful Lanikai beach wasn't bad and it was much better to walk than to try to find parking near a beach access point. Parking was near impossible. Another main issue with home was the several access points to our floor from the downstairs where Patrick stayed. That feature was not mentioned in the description to my knowledge. We still had a good time. Perfect house for a truly memorable vacation! Lanikai Charmer was the perfect house for our stay in the islands. The house had plenty of space and made our family feel right at home. The kitchen was equipped with everything we needed, and the beds were really comfortable after a long day at the beach. Upon our arrival Patrick who over sees the property introduced himself, and made sure we had everything we needed for our stay. The house is a short 5 minute walk to one of Oahu’s best beaches. The house also came with boogie boards, floats, chairs, and a cooler for a day at the beach. My favorite part of the House was the view!! The house has huge windows in the dinning room/living room with amazing views of the Mokes. I will miss waking up and enjoying my coffee looking at the amazing view and listing to the birds. We were very pleased with the house, and would definitely rent this house again for future Oahu vacations. perfect for a family getaway - lovely view, comfortable surroundings, & kind people! First time staying in Kailua when visiting Oahu - a perfect balance of being close to Honolulu but not having to interact with the business everyday. Downtime came easily with the emminities of this property. Full of Aloha! Wonderful, did not want to leave! Our stay here was wonderful. Kitty and Patrick made my group of 9 adults feel right at home! Kitty called and checked in on us the first day to make sure we settled in ok and to check to see if we needed anything. Patrick lives on site down stair, we saw him once in a while but never felt that our privacy was invaded in anyway. We had plans to visit Montana, but had to cancel due to the raging wild fire! We decided to book Oahu instead and only had 1 week to find a place to fit all 9 of us. Kitty was gracious enough to allow our party of 9 to stay at her home and even accommodated us by providing a top notch blow up mattress. The futon was surprisingly comfortable, and the linens were so soft and clean. The outdoor patio furniture outside with the view of the Mokolua islands were comfortable too! I actually fell asleep a few times laying outside. Also, waking up each morning to the sunrise from the master bedroom was just beautiful. The house was spacious and we never felt crammed. During our stay we had an issue with one of the electrical outlet and the garbage disposal was acting funny. We told Patrick about it and he attended to the problem immediately. One other thing to mention, it was great having the beach towel, lounge chair, and cooler available for us to use. Lanikai beach was less than a 10 min walk from the house. This beach is by far one of my top favorites! The water was clear and the color a beautiful teal. Overall, the whole experience was absolutely wonderful! Glad we decided to stay here instead of crazy busy Waikiki. We were close enough to Waikiki that it wasn’t a problem when we wanted to go out to drink and party. I wished I could have stayed longer! Oh another thing I forgot to mention is, Kitty recently purchased a new L shape sectional for the living room ( not shown in the picture), and it was so comfortable! Thank you Kitty for allowing us to stay in your home! Property is located to nearby Kailua Town which has all the conveniences you need and to Kailua Beach which is the best beach on island! Although worn and in need of maintenance, the property was well-equipped with beach chairs, boogie boards, towels, kitchen utensils, etc. It was decorated in traditional Hawaiian style. The manager Patrick is onsite and was very responsive to our needs and requests. Only one booking per 30 days due to zoning laws. An additional $50 will be charged for any guests (including children) after 6 guests.